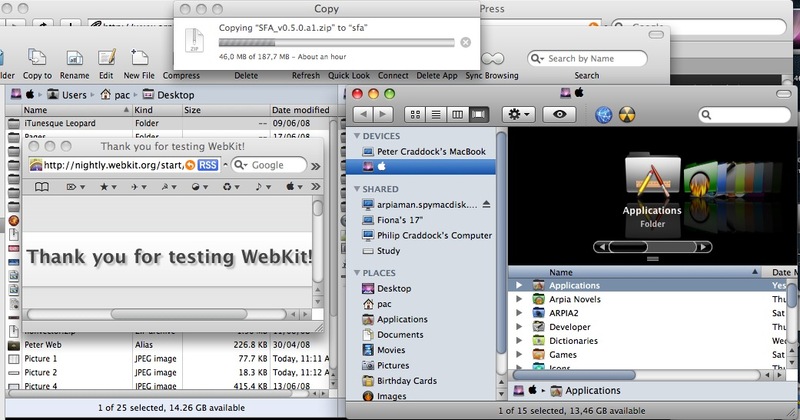 Mac OS X “Leopard” came as a (slight) disappointment for many users in terms of the general User Interface (UI), because while its goal was to unify the UI, many aspects still fall short of this unification. Snow Leopard, which just came out, doesn’t seem to change much of that. One of the greater qualms people have with the (Snow) Leopard UI is the continued use of “Aqua” elements, especially when iTunes, historically Apple’s “new UI testing ground”, has been devoid of Aqua scroll bars and list headers for some time. This page is therefore a collection of small modifications you can bring to the (Snow) Leopard UI in order to make it more unified. Note: they are now included among the many options of iLeopard (since iLeopard 2.1). Snow Leopard users: new iTunesque versions have been included. See the download section. If you wish to bring back the iTunes 8 look to iTunes 9, see the download section as well. As you can see in this image (which has Finder, Forklift and WebKit on it, FYI), a number of Aqua elements have been replaced by “iTunesque” elements: scrollbars (normal and small), progress bars, and the list headers. This modification will be referred to as “SPL” once we reach the final stage (where you get to choose exactly what modification you want). iTunes 9 changes: iTunes 9 comes with different scrollbars (among other changes). As such, some iTunesque packages have been made to match the iTunes 9 look. These will be called “SPL 9” in the final stage. The so-called “traffic lights” are the three little blobs you find in the top left corner of windows, the “close”, “minimise” (sorry, British spelling) and “zoom” buttons. This modification will be referred to as “Aquaffic” in the final stage. The reason for this name is because I hope to also make some traffic lights in the same vein as iMetal, which would then be “Metaffic” in the final stage. The original Mail & Preview toolbar buttons are in the shape of “curved pills”, but they do not match the style adopted for the standard Leopard rectangular toolbar buttons (style which was adopted by many applications, also in the form of curved pills). Not perfect, but close enough. The curved pills will be called “CurPill” in the final stage, and the rectangular ones, “RecPill”. 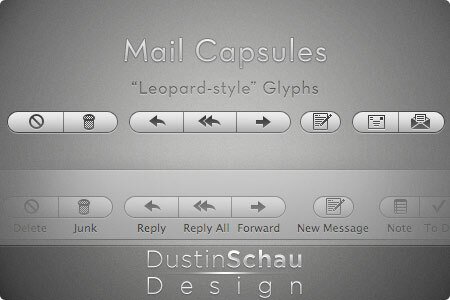 MacThemes user Dustin was kind enough to make new glyphs to go with the new pill appearance. These glyphs will be called “Glyphs” in the final stage. Note: the glyphs are completely independent from any theme elements and are located within the applications in question. As such, you can use them with any theme, but you may have to re-apply such modifications if Mail and/or Preview are updated. ITUNES AQUAFFIC USERS: if you want the Aquaffic traffic lights, download one of the following updates, according to your version of iTunes, and apply it after having installed your iTunesque package. If you have any problems with these files, please contact me (details on the “About” page), or post on this page. Note: if you wish to combine two themes (“iTunesque” & “KISS me”, for example), read this tutorial. Magnifique is a theme manager and installer for Leopard, and there are now two iTunesque packages for Magnifique. If you wish to obtain additional iTunesque packages for Magnifique, please let me know. The one available from the Magnifique website and from within the Magnifique application is the "SPLC" variant with glyphs. A second variant available from here (to add manually to Magnifique) is the SPLAR variant. Note: this contains Aquaffic for iTunes 8.1. For other (and future) versions of iTunes, check the Aquaffic updaters above. I’m afraid they changed the way the interface was handled, and I haven’t kept tabs on how one should actually go around modifying it. All I can recommend (as I know I won’t have time to investigate) is going over to the Macthemes.net forum – I see the two top topics concern the interface elements in Lion. Hi Peter, any ideas on how to change the remaining aquaish elements in Lion? Last time I made changes to the UI in Leopard I checked your tutorial ‘Combining Leopard themes your way’. Do you know if the UI in 10.7 still works more or less the same way you described there? Dear Richard, I haven’t yet attempted to look at the inner workings of Lion. If the transition appears to be easy, I’ll likely get around to making Lion versions. Otherwise, it may be an “on request” thing. hi peter, any idea if your mods will work on Lion? hi Peter, 9.2.1 mod seems to work perfectly!!!!!! You re the BEST!!!!! Thanks for your hard work. There we go: iTunes 9.2.1 packages are now available for all iTunes mods. Dear Richard, I’ll attempt to bring a series of iTunes 9.2.1-compatible updates to iTunesque, including Josh’s mod, in the coming week. Stay tuned. hi Peter, any idea if there will be an update to your installer for Josh Janusch’s mod that fixes the ipod glitch in itunes 9.2.1? Gnico, I have added a link for 9.1 (easy fix). Hi and thank you for your great work! Peter, no worries. Anything you can do, when you can do it, would be great. Ravi, sorry about not responding earlier – January has been busy, and I’ve been unable to work on the iTunesque + iLeopard variant. I’ll do my best to get something ready for you soon. Peter, I am using the vanilla — SPL9 for Snow Leopard. What I would like is some suitable styling of buttons (such as the “Submit Comment” button on this comment form). iLeopard has some nice buttons over at Magnifique: http://magnifique.pcwizcomputer.com/forum/filebase.php?d=1&id=19&c_old=2&what=c&page=2. Personally, I love the Metal Muku buttons, but I’d happily settle for the iLeopard versions. Thank you much for your responses. Ravi, in your case, which iTunesque variant do you use, and what changes would you want me to bring to an “iTunesque + iLeopard” variant of it? @peter, we are a patient bunch. Actually we are not ;-), but given that Apple has stuck around with the horrible candy bars for 3+ releases, you are our last hope — so we will keep the life support system charged and pray hard and hit the Donate button when it appears on your site. But please, please don’t make us go back to Aqua. We can’t. We won’t!! BTW, any thoughts on SnowTunes? Work wonderfully, now I just need Itunes with the same and its complete. This is brilliant and you deserve the Nobel peace prize! But any chance you can give us replacement buttons as well? The candybar/aqua “Save”, “Cancel”, etc buttons are now the only vestiges of the ugly Aqua interface on my computer, and I would like them to disappear as well. Thank you. I have uploaded the modification: AR Grow. Let me know if it works (haven’t tested it). Hi Peter, was wandering if you can make the mods for me like you did dated 29 April 2009 at 08:39. See your post above with screen shot. I’m using Aquaffic + Recfill and would love those changes again. I’m afraid not. Your best bet is to download the iLeopard 3 alpha, even though support has been discontinued. Is there a version of iTunesque that also changes other UI elements like buttons, checkboxes, comboboxes (like iLeopard did) ?